For the first time ever, Antarctic Alien Overlords GWAR will hit the road beginning tomorrow as part of the Van's Warped Tour. The tour crisscrosses the United States, running through August 6th in Pomona, CA. A complete list of dates can be found below. Last week, during GWAR's Vans Warped Tour social media takeover, the band announced the name of their forthcoming new album; The Blood Of Gods. The record will be released this fall via Metal Blade Records. The album is a hard rock masterpiece, a new milestone for GWAR's music that will be totally unexpected, and is going to blow people away. Speaking of blowing people, this is the first album to feature the Berserker Blothar on lead vocals! For those of you human scum that are attending the Vans Warped Tour, you will have your chance to pre-order the album before anyone else. 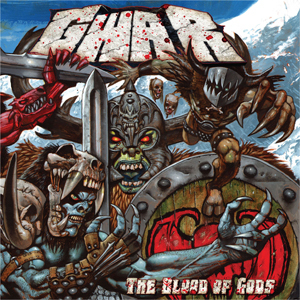 That's right Bohabs, just head over to the GWAR merchandise tent to pre-order your copy of The Blood Of Gods. When you give the hateful slave working the GWAR merchandise booth your hard earned cash, they will give you a special laminate that will guarantee you a copy of the CD upon release date. So act now, and spare yourself the wrath of the most violent band in universe... And don't lose your special laminate, it's your ticket to a guaranteed lifetime of eternal suffering! Guitarist Pustulus Maximus did his best to explain the pre-order process in a video below. Following their run on Vans Warped Tour, the band will make an appearance at Chicago's Riot Fest, as well as two other headline dates, before they return home for a brief Antarctic slumber. Expect a full fall tour in support of The Blood Of Gods. More details on the new album, including artwork, full track listing and your first taste of new music will be made available over the coming weeks.